Thank goodness for the triumphant return of Junk Mail! 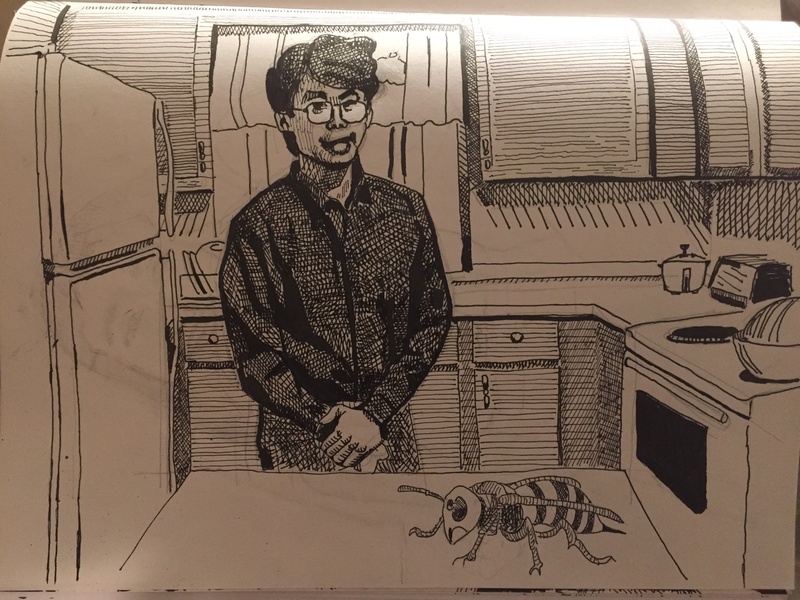 Cooking with Gerry fan art. I’ve included the giant wasp from episode 666 as a co-host. You got mail, mail is good, I like my mail. Can Jay please post diagrams or blueprints of his Crossing Border lanes? I’d love to get a police procedural going here. Maybe something like “The Thin Blue Line” re-enactments? You’ve been “coned”! How did I not know Looker was coming out on blu-ray?? Im usually pretty up on this stuff. Will have to order that soon. It’s a fun one. I don’t remember it being a wooden box but rather a regular cardboard one. I actually googled McG and didn’t even find a Twitter account for the man until I reread Sean’s post. I want the undercover footage documentary, but I’ll take storyboards, too. Frank, AvP is cannon now. Remember when Jay use to not live in a US border jail? Let’s get to the real nitty gritty regarding digital vs physical media. Why do movie collectors need to own films? How many films are truly re-watchable? Nice, but… what’s he doing with his hands? I didn’t immediately register what happened with Brown’s character so I think I missed something there. Did he just misuse the weapon somehow or was there a clear reason why it did that? Learning about ending reshoots afterward wasn’t surprising. Olivia Munn seemed to have superhuman speed at one point and the final scene felt so tacked on, among other things. The Predator franchise isn’t popular enough for that kind of sequel-baiting, especially without an Arnold. The Alien series is bigger, but even Alien: Covenant didn’t do well enough to make a follow-up a sure thing. 4 stars for this Predator mess? I guess Shane Black has definitely joined film junk’s “free pass” directors now. Thank god at least Shaun talked some sense. Gotta guard the crotch from potential giant wasp attacks. Reed’s got some sense. I’m a huge movie collector and yeah, I agree many are not rewatchable and I tend not to re-watch movies all that much anyway (Letterboxd has me at 11% of the movies I watch are re-watches). But I enjoy the idea of having them. I still own a ton of DVDs, which I should probably just sell. Sitting on around 1700+ blu-rays if my filmaf.com account is accurate. I find it best not to think about the possible uselessness of it all. That’s my Rod Serling pose. Why do people collect anything? I was surprised they all liked it as well–there were so many lapses and inconsistencies in the script that I figured a bunch of stuff had been left on the cutting room floor (I may have missed it but did they explain where that RV came from?). Anyway although I think Predator 2 is a bad movie, it at least has a gonzo cast going for it. So my rankings are The Predator, Predators (which is really pretty good), Predator 2, and this misfire. We’ll see how that lines up with the premium discussion. Well I ain’t gonna rewatch it to refresh my memory, the important part was the fact that he took these alien things out of the pack, packaged them up with foam rubber and sent them on without question. Seemed ridiculous, which I guess is appropriate for this film. I took it thtat the RV belonged to the McKenna’s. My sentiments exactly. I was wondering at the end what happened to him and later deduced he must have used the Predator glaive like the guy before him in that one dark scene in the woods and it blew up his head. Kind of a strange death for the main bad guy in a blink-and-you’ll-miss-it moment though. I understand the appeal of collecting physical things — you see them every day, there’s a certain comfort in them, they have aesthetic value. But I’m not sure I get the point of a digital film collection, versus just paying $4.99 to watch something when the mood strikes. I mean these are just files on a computer — it’s hard to imagine that scrolling through an iTunes library could be pleasurable or satisfying in the way that actual shelves crowded with actual movies (or books, or whatever) can be. It seems like other people missed it, too. The descriptions of what happened basically match up with what I thought I saw – the shoulder canon turned as he turned his head toward Olivia Munn and fired. I still don’t get why, but it’s such a quick gag so I guess that’s intentional. Seems strange that such an accident could happen, considering that the Predator’s head is larger than a human one. Anyway, I would’ve just assumed Traeger to have a more staged exit that the actual death in the film. It’s not just about re-watchability, it’s about, well, having a collection. Something that represents your interest, your taste, and your passion. Why do people buy books? Do they re-read all of them? And action figures? Do they play with them all the time? And I don’t consider a “digital collection” anything other than a bunch of ones and zeroes. However, collecting physical media can easily turn into hoarding. That’s why one of the joys in having a collection is curating it. You don’t have to buy everything just because it’s cheap. Could be I’m wrong, but in my opinion DVD’s will as exotic as vinyl in about a decade’s time… Already some films are only available on DVD and could stay that way. 1700 is a lot. But only you know what you really want and what you don’t want/need. Agreed. This was easily the biggest dissapointment of the year for me.